Aggressors: Ancient Rome puts you in a role of one of many factions in Mediterranean area and lets you find for the dominance over the known ancient world. Of course, the Rome itself is probably the faction the majority of players will choose, but any single one of them is a viable way to play the game and experience everything it has. Is Aggressors Ancient Rome a 4x game? First of all, we should ask is the question and Aggressor Ancient Rome is truly a 4x game; we had a similar question regarding Warhammer 40K Gladius, and while both games are no doubt a very successful and appealing titles the question still remains if this description is accurate. 4x games consist out of four very important stages or activities; explore, expand, exploit and exterminate. Initially, this description was applied only to space games such as Master of Orion 2, which is widely considered to be the first of its kind. Essentially a player first explores his or her surroundings, then expands, colonizing the worlds in vicinity (or, as in this case, territories), to subsequently exploit local resources and finally exterminate all opposition. In my humble opinion, this game is far more of a grand strategy than a 4X game, having much more in common with titles such as Europa Universalis rather than Master of Orion, Galactic Civilizations or Endless Space. But regardless whether you agree with me or not, this is a fascinating strategy game that earns its share of attention and will definitely provide challenge for the players. One of the strengths of Aggressor: Ancient Rome is the depth of its gameplay, where it truly gives of a grand strategy vibe. If observed superficially, the game might remind someone of Total War series, but it actually falls somewhere between the TW mechanics and Europa Universalis scope. While it does have a turn based character on the campaign map, like TW series, it lacks the actual tactical combat of these titles and has far more diplomatic, military and trade options than an average TW title; here, it resembles far more the other feature-rich titles that may come from the Slitherine or Paradox Interactive, for that matter. The combat is a clash of stats and the player can’t influence the battle once its started. Does the lack of tactical combat diminish the quality of the game? Not at all, although I have personally always preferred to have some, if any, control over the military forces at my disposal, no matter how rudimentary it is. The strategic approach has its merits, since it puts a player in the role of a political, diplomatic and economical leader, someone who is bound to see the greater picture and leave the war in the hands of (hopefully) capable generals. The graphics of this game is on the level of the genre, which is to say – satisfactory. The strategy titles, especially those with a significant depth of gameplay and an abundance of features rarely rely on the visual appeal, anyway. Music, however, was an entirely different story, and at some point it would actively ruined the atmosphere for me. 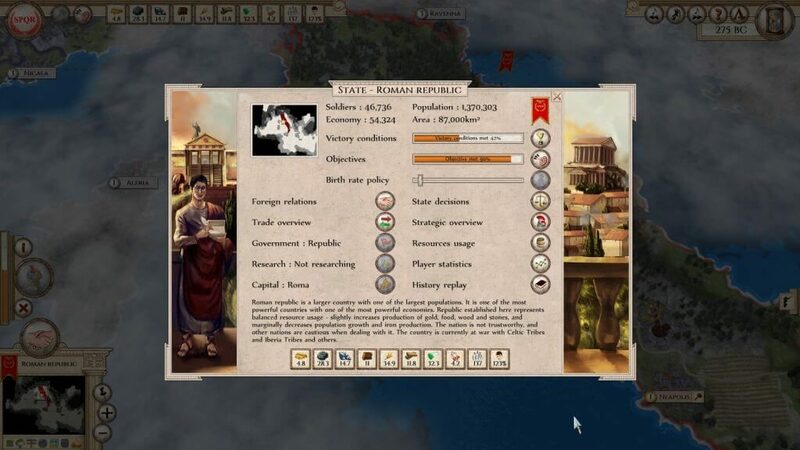 In games such as this, the music works as long as the player is “in the zone”, fascinated with the flow of events and deeply invested in the empire management. When the player actually sits back and consciously acknowledges music, then we have an amazing track. However, when the music -as the case was sadly here – does not always fit the surroundings then the immersion is easily broken. Not that I ask for a Hans Zimmer soundtrack (although that would be just snazzy!) but when I hear the native American tribal type of music in my ancient Rome game, my brain automatically shuts down to prevent any lasting damage. Aggressors: Ancient Rome is a very solid game that is actually a quite decent entry from Slitherine to the 4x genre, should we decide to extend the original definition to include games like this into the fold. The fans of the strategy genre and Slitherine in general will surely like the game more than an average Joe, who will hardly be converted to a Clausewitz after playing a campaign or two. The replay factor is decent due to the possibility of generating random maps and some 20 factions one can chose from. It also strives to be historically accurate and manages it, aside of few geographical mismatches mostly due to the core mechanics of the map gameplay. Overall, I can recommend this title to all the fans of the genre and remain fairly certain that they will like it! 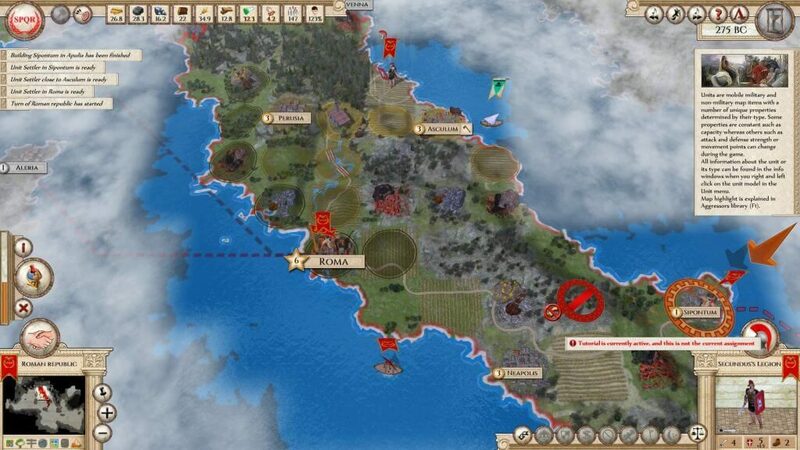 Aggressors: Ancient Rome is a great strategy game with a high replay value and an impressive depth of gameplay. Even though the game lacks the tactical component it makes up for it on the grand strategy scale.